Many automation project requires communication with Modbus Rtu / Tcp Ip.You can use Modbus Rtu / Tcp IpActiveX with is flexible structure in your projects as a Modbus RTU / Tcp Ip communication interface. Modbus Rtu / Tcp Ip ActiveX is sold with company license. License owners can use this Activex without limitation. 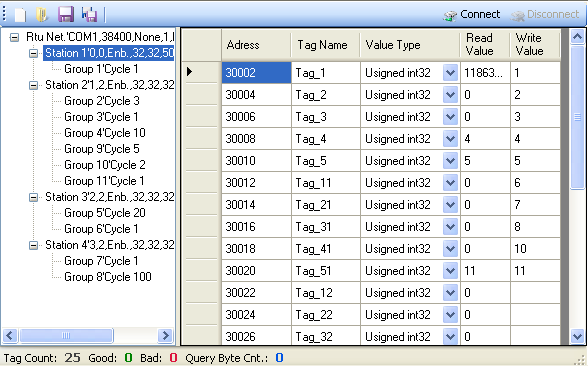 At Modbus Rtu / Tcp Ip ActiveX, .NET Framework 3.5 is used. This ActiveX has a very high communication speed. A word of size data can be read 75 times at per second. ActiveX made by considering to easily meet other probable needs of program and easily attach to user’s programs.For this purpose functions that is not contained by ordinary ActiveX’s are added for example project save, open saved data. Thus you can finish your project’s all operations about Modbus communication in a couple minutes. Download link will be only displayed to registered users. When this property True, component will continuously try to connect if PLC is off or there is another communication problem. Connection will be established when PLC ready. False disables this property . Sets or gets the value. TagId is the row number in the Tag list. Following line assigns the value of Tag which locates in the row 1 to variable i. Returns the file name which contains active settings. Example: Following line displays the active settings file name. Loads previously saved setting file to the component. Return value of this property is file path. Example: Following line loads the settings from the file which indicated by “path” variable. Saves the current connection settings to given path which contains filename. Example: Following line saves the settings to the file which given in “path” variable. Sets or gets the connection status of component. Component connects to the PLC when this property becomes True. False, disconnects the component. This property returns True while component trying to connect. Real connection state is given by Connection property. Connection state can be get from this property. Returns True after the connection established. Following line assings Connection State to “str” variable. Gets or Sets the PC Baudrate property of component. Following line assigns PC Baudrate value to “str” variable. Following line sets Component’s PC Baudrate property. Gets or sets the Com Port that component uses. Following line assigns the Com port’s name that component uses to “str” variable. Following line sets the component’s com port to the which indicated by “str” variable. Gets or sets the PC Parity. Following line sets components Pc parity. Following line assigns component’s parity to “str” variable. Gets or sets the component’s PC Stop Bit. Following line sets the component’s Pc Stop Bit. Following line assigns component’s PC Stop Bit value to variable “i”. Gets or Sets PC Flow Control type. Following line sets component’s PC Flow Control property with the “str” variable. Following line assigns component’s PC Flow Control value to “str” variable. Gets or sets components Poll.Interval property. Following line sets component’s Poll Time property. Following line assigns component’s Poll Time value to “i” variable. Gets or sets component’ s Timeout period. Following line sets component’s Timeout period. Following line assigns components Timeout value to “i” variable. Gets or sets PLC address. Following line sets the address number of the station that indicated by “st_name” variable. Following line Assigns address number of the station that indicated by “st_name” to i variable. Gets or sets that how many times the query will be repeated when connection fails. Following line sets the Fail Repeated Queries of the station which indicated by “st_name”. Following line assigns the fail repeated queries number of station which indicated by variable “st_name” to i. Sets or gets if Function Code 6 enabled. Following line activates Function Code 6 on the station which indicated by “st_name” variable. Sets or gets Coil Maximum Size. Following line sets the Coil Block Size value of the station which indicated by “st_name” variable. Following line assigns the Coil Block Size value of station which indicated by variable “st_name” to i. Gets or sets Discrete Input maksimum size of the station. Following line sets the Discrete Input maksimum size of the station which indicated by “st_name” variable. Following line assigns the Discrete Input maksimum size of station which indicated by variable “st_name” to i. Gets or sets Holding maximum size of the station. Following line sets the Holding maximum size of the station which indicated by “st_name” variable. Following line assigns Holding maximum size of station which indicated by variable “st_name” to i. Gets or sets Input maksimum size of the station. Following line sets the Input maximum size of the station which indicated by “st_name” variable. Following line assigns Input maximum size of station which indicated by variable “st_name” to i. Returns whole tag list as an array. Following line assigns Tag List to array named “TagArray”. Returns False if erroneous value in Tag list. Returns True if no erroneous value. Following code notifies user about the Erroneous Value. Imports existing Tag List to component If your application project contains more than one Modbus Component or there are another Tags in the project. Checks tag names for being unique with the component’s and given tags. The parameter that passed to this method is varies according to being component NET or COM. For NET Component, tags should given in array type. Sets or gets cycle value of given group. Following line sets the Cycle value of the group which indicated by “gr_name” variable. Following line assigns Cycle value of the group which indicated by “gr_name” to i. Sets otr gets the visibility of the File menü buttons. Following line sets the visibility of the File Menü to false. Sets or gets the visibility of the Connect – Disconnect buttons. Following line sets the visibility of the Connect – Disconnect buttons to false. Sets or gets the visibility of the ToolStrip. Following line sets the visibility of the ToolStrip to false. Sets or gets the visibility of the StatusStrip. Following line sets the visibility of the StatusStrip to false. Enables or disables right click menu of the Network TreeView. Following line disables right click menu of the Network TreeView. Enables or disables right click menu of the Tag List. Following line disables right click menu of the Tag List. The event that triggerred when mouse button get down on the component. The event that triggerred when mouse moved on the component. The event that triggerred when mouse button up on the component. The event that triggerred when keyboard key down on the component. The event that triggerred when component connected. The event that triggerred when value different than previously value which read from the PLC. This event sends Tag value with tag’s row index(Tag_Id) to application. All tag values is sent once to main application when communication started. The error which occurs while reading from PLC are sent to main application with tag’s row index(TagId). The error which occurs while writing to PLC, it passed to the main application with tag’s row index(TagId). Sends the component’s connection timeout status to main application when PLC connection unsuccessful. The other errors is informed to main application with this event. This contains error message as well.